Off-road vehicles claim to be able to go anywhere, but they can’t. Cars, dirt bikes, and ATVs can’t fly, nor can they swim. The FAA might have something to say about the former, but Michigan’s Gibbs Sports Amphibians hopes to achieve the latter. The Gibbs Quadski is the mutant offspring of an ATV and a jet ski. On land, the Quadski behaves like a normal ATV, but at the push of a button the wheels retract and power is transferred from the rear differential to a propeller. That power (175 horsepower and 103 pound-feet of torque, 140 hp on water) comes from a 1.3-liter four cylinder engine from a BMW K1300 motorcycle. As with any vehicle that is neither one thing or another, there are compromises. Despite its considerable size, the Quadski can only carry one rider. It’s also rear-wheel drive, which may limit its performance on tough trails. Amphibious motoring also doesn’t come cheap. Gibbs has not finalized the price, but company representatives say the Quadski will cost around $40,000. That is a lot of money for a quad, even if it can drive on water. The Quadski may be flawed, but that’s not surprising given how difficult its development has been. Gibbs has been developing amphibious vehicle technology since 1996, spending $200 million and accumulating over 300 patents. Until now, the result of all that work has been nothing. 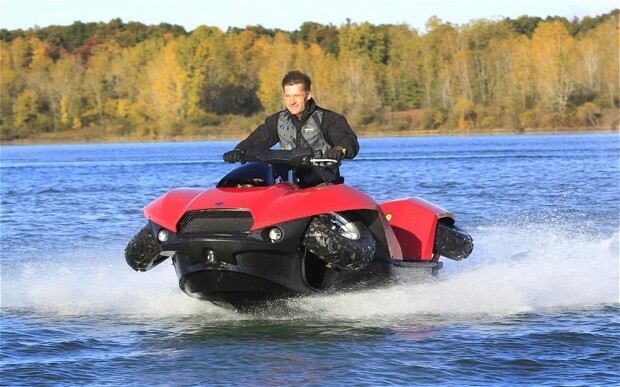 When it goes on sale in November, the Quadski could be the first amphibious vehicle to sell in significant quantities. Gibbs has dealers lined up in Florida, Texas, New York, and the Midwest.